ISSUE 02 – BITE ME! 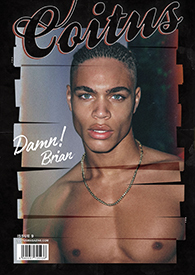 Returning with a celebration of youth; Coitus launches an impressive second print issue with contributions from the best talent around. Featuring some of the hottest young male models in the world today. With limited edition 1000 copies and therefore 200 copies per one of the five covers, Coitus issue 2 is defiantly a collector’s item. Marlon Teixeira, Francisco Lachowski, Arthur Sales, Sebastian Sauve and River Viiperi. Philip Jelenski, Ryan Bertroche, Rory Torrens, Simon Kotyk, Ryan Schira, Matthew Evangelisti, Christopher Wetmore, Yannick, Haiden Nelson, Martin Rogal, Henry Watkins, Kevin Martinez, Simon Jennings, Humbert, Joshua Bell, Fredrik E, Max Eockinqs, Rory Watson, Dennis Droemer, Aleg Romanov, Kevin Freed, Jullien Herrera, Theio Maddix, Jay H, Filip, Tom Norkett and George Tarrant.